Rising prices in U.S. Cities is a good sign for sellers in Vermont. It doesn't mean that prices are going to start to rise overnight or even over the remainder of 2012 in Stowe, but it does project well for the future. 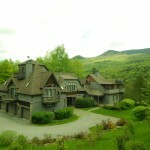 Stowe being ideally located within driving distance of Boston, the greater NYC area and Montreal is posed to benefit from stronger home sales in these cities. Read more about the rise of home prices: Home Prices Rise in Half of U.S. Cities as Markets Stabilize - Bloomberg.